It’s a phrase we’ve all heard at one point. It might have been during the height of a dramatic movie, or a sports commentator after a stellar play on the field. “They’ve really pulled out all the stops.” But if you play the pipe organ, this phrase has a very different meaning. Join Whitesel Church Organs as we explore the history of this phrase, and how it’s used in the common parlance today. In modern usage, “pulling out all the stops” means to give something all your effort, to commit entirely to a task or situation. This is why it’s a popular term for sports, when a player makes a major play, or when the star of the movie makes a daring rescue. The phrase was first used in its modern form in 1865 when the writer Matthew Arnold said “knowing how unpopular a task one is undertaking when one tries to pull out a few more stops in that … somewhat narrow-toned organ, the modern Englishman.” This usage speaks to how we use it today, as well as the origin of the phrase itself. By now, any pipe organ player knows where this phrase came from. It is, of course, a reference to the stops used on a pipe organ. The stops regulate the flow of pressurized air into the pipes of the organ. These stops can be used at the whim of the organist and can be turned on and off to let air into certain pipes or stop it altogether. 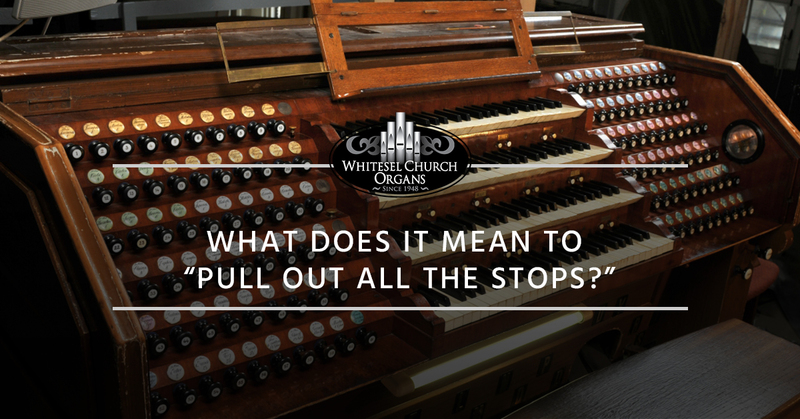 When stops are used selectively, or in clever combinations with other stops, the organist can create subtle, or dynamic changes in the sound of the organ music. Some combinations of stops might create a full, bold, and brassy sound, while other combinations might yield a delicate, whispery sound. Organists select the stops that best suit the needs of the piece they are performing. So, in the case of organ playing, it’s modern usage is very similar to its usage in organ performance. To pull out all the stops then means to literally undo all the stops on the organ, and allow the instrument to play to its fullest, loudest capacity. Nothing is held back! So the next time someone tells you to pull out all the stops, make sure to play your organ loud and proud! When you’re ready to take your organ playing to the next level, get in touch with Whitesel Church Organs. We’ve been providing unbeatable customer service to organists for nearly 70 years. We’re experts in organ repair and maintenance, often beating our competitor’s prices. If you’re in need of a new organ, browse our selection of top-tier Viscounts Organs, as well as our hybrid organs. Though we’re based in Harrisonburg, Virginia, we’ve worked with clients all over the entire United States. At Whitesel Church Organs, we pull out all the stops to ensure your pipe organ sounds as good as your playing.